Campbell Soup's newly enlightened direction is a dramatic break from Big Food's fierce fight against federal legislation and state ballot propositions to mandate labeling on GMO foods. In 2012, the Who's Who of Modern Industrial Food... Monsanto, DuPont, PepsiCo, Coca Cola, Nestle USA, Campbell's, Kellogg, J.M. Smucker, General Mills, many more... defeated California's Prop 37 (for GMO labeling) with powerful political might and hundreds of millions in advertising. Similar measures were narrowly defeated in Oregon, Washington and Colorado, and passed in Vermont. Twenty states currently have pending or proposed legislation to require labeling for GMO foods. 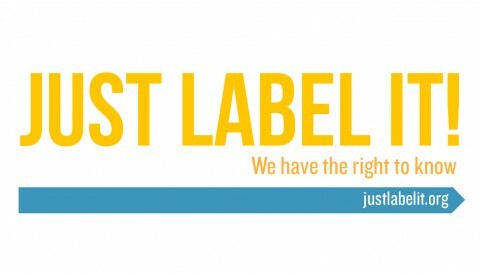 (source - JustLabelIt.org) In the U.S., almost all non-organic corn, sugar beets, soybeans, rice, canola, and cottonseed oil are genetically modified, and by large industrial food corporations. One or more of GMO ingredients is present in virtually all processed food sold in U.S. markets and grocery stores, from cereals, cookies, and crackers to ice cream, peanut butter, oils, deli items, and, well, everything. Mind you, Campbell Soup has not pledged to remove GMO ingredients from its products, but merely to disclose their inclusion to consumers, who can then judge for themselves to buy or not to buy. "Ingredients derived from these crops are in many of our products. We also believe that GMOs and other technologies will play a crucial role in feeding the world." Kudos to Campbell Soup Company for leading the way by breaking the GMO stalemate between consumers and Big Food mega-corporations. I believe in rewarding corporate leadership that does the right thing by consumers. Please join me in reaching first for Campbell Soup Company products over processed foods by companies that don't support our right to know what's in our food. By taking our business to companies, as Campbell Soup, who do the right thing, we will encourage others to follow their good example. Cambell's is going non-GMO? ?..bwahahaha....campbells soup is about as FAKE as you can get. Take a look at their ingredients. HYDROLYZED YEAST EXTRACT...yep, a nice word for MSG.